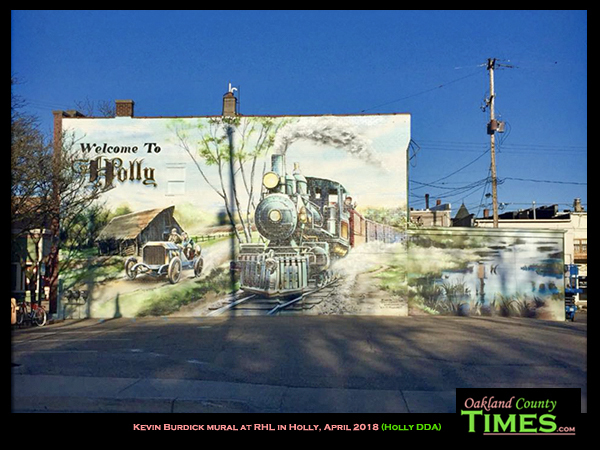 Holly, MI – A new mural covers the back of the building where Broad Street and Battle Alley meet in Downtown Holly, across the street from the Holly Hotel. 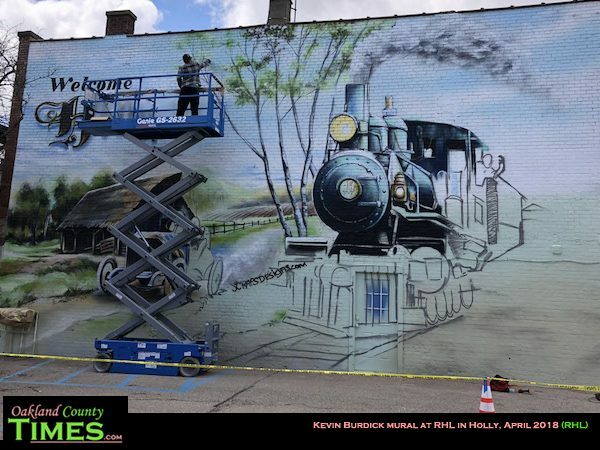 What once was a gray railroad scene taking up just part of the space on the reddish brick wall, has been painted over with a larger than life train engine and antique automobile, coming around a swampy bend, with bright-colored hot air balloons soaring into a blue sky behind a weathered-looking barn. 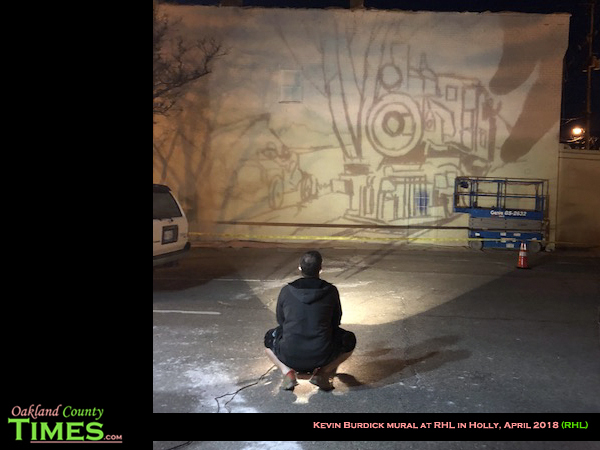 Artist Kevin Burdick grew up in Fenton and pursued art at Mott Community College and then the Art Institute of Pittsburgh. 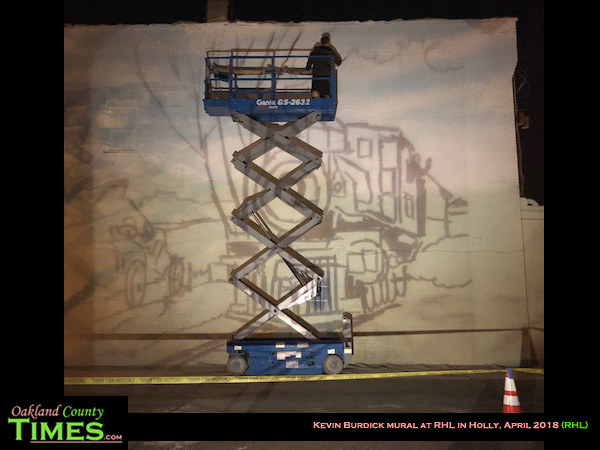 Airbrushing became his passion and he’s been painting buildings and cars for the past decade. He owns Scraps Designs, where he puts his art to work for commercial, governmental and residential clientele. 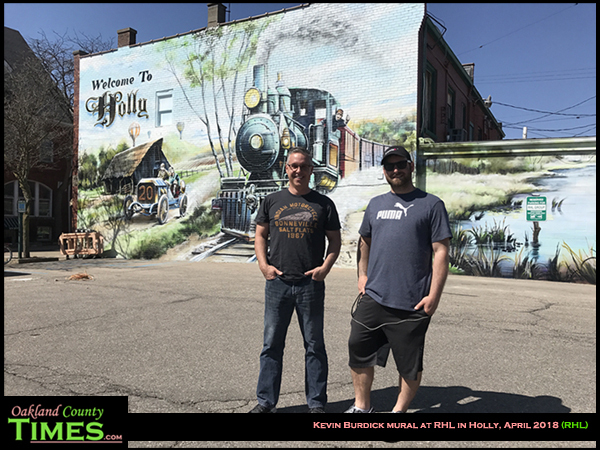 Among his favorite locally are at Detroit Grooming in Ferndale, and murals at Clarkston and Grand Blanc schools, plus a few that are up in Fenton. He was contacted by Randy Redmond, owner of RHL Group (and also the building at 115 Battle Alley). 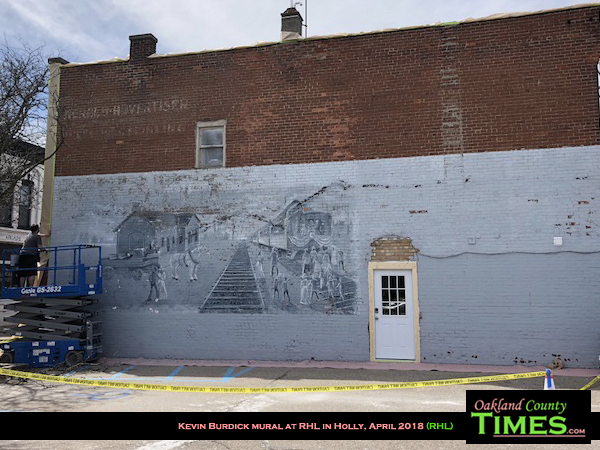 Redmond had seen Burdick’s artwork at the former Good Wood building, and asked him if he’d like to paint one a little up the road. 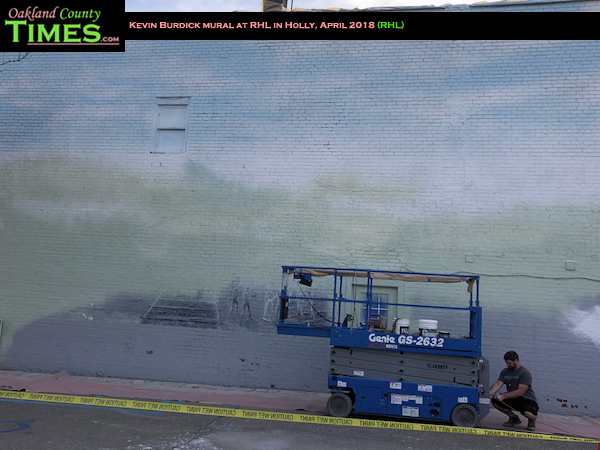 After they brainstormed ideas, Burdick painted the entire mural in less than a week. 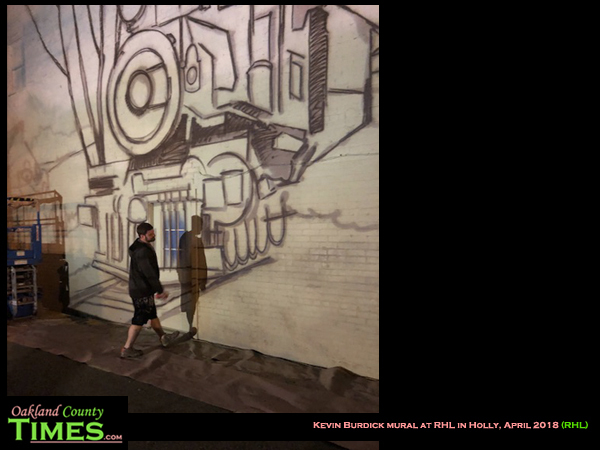 “He was out here at night with a projector getting the basic lines up. 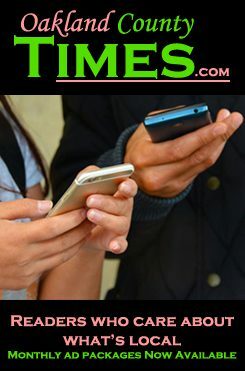 It was amazing to watch,” Redmond said. 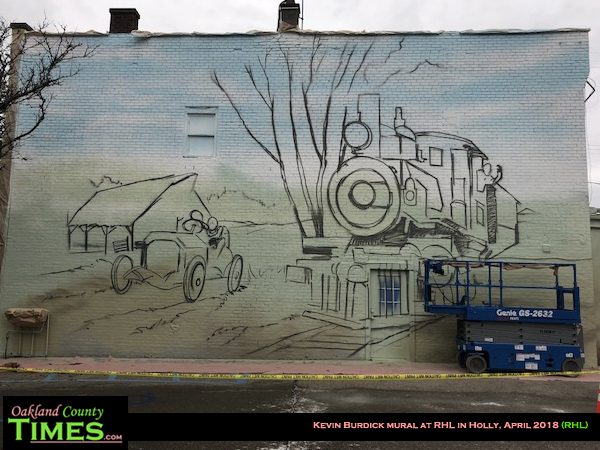 The RHL mural has pieces of ideas from both the artist and the patron. The number 14 is Burdick’s lucky number – the one from his college soccer jersey. And Redmond’s jersey was lucky number 20. 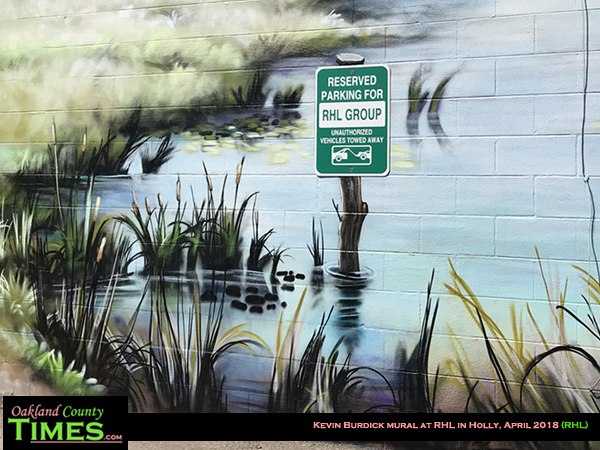 The letter RHL can also be found in a special place on the mural. Redmond suggested adding the balloons as the project neared completion, remembering how special it is for Holly to have hot air balloons often floating overhead. “I wanted this to be something that fit in with the community and our history. Holly is really starting to come around. It’s exciting to see the changes. Katy Hughes and the DDA are doing a great job. Businesses are moving in, the downtown looks great. I kept seeing all the changes and I thought, this is one way I can contribute, to help with the positive momentum,” Redmond said. The painting on the wall before had been there since the late 1970s. Many families have memories of posing in front of the mural, and Redmond hopes people will do the same here. For Burdick, the thrill is in being able to so such a large piece so close to his home and family. He especially hopes that his Great Aunt Carol will like it, he said as he cleaned up the last of the supplies Monday morning. “Aunt Carol is a professional artist. She does abstracts, oil painting, fine art,” Burdick said. “She wouldn’t let us use coloring books because they were so limiting. She’s my main inspiration. 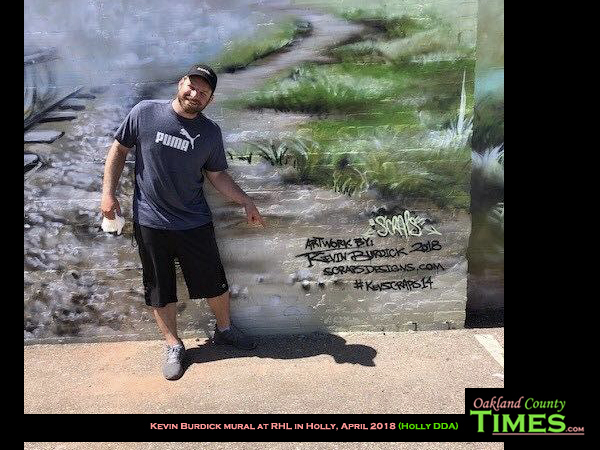 The years of practice and experience have been paying off, not only in being able to run his own business, but in seeing the way his art makes people happy. For more Holly-related stories, check out our HOLLY NEWS PAGE.